It’s not a real thing. We’ve all bought into this idea (it’s more like a lie) that motivation is what will finally push you to go after your big goals and most unreal dreams. You’re never going to feel like it. Motivation doesn’t just come in an instant and stay for the rest of your life. So, instead of approaching changing your life and accomplishing your bucket list like a huge task, you must start thinking about the small changes you make, every day, that make life-altering positive differences over time. That’s why The 5 Second Rule is essential to learn–it will be the push you need in the moments when you don’t feel like, but know you should do it. If you’re not familiar with the 5 Second Rule, you can learn everything you need to know about it in this article. It’s a remarkable Rule that has completely changed my life. Here’s the thing. When I created the Rule, I didn’t know how or why it worked. I just knew that it did. As I shared the Rule with others and they started using it, people started reaching out to me, asking HOW and WHY the Rule worked so well. I decided to do some research. What I found was fascinating, and I’m going to share it with you right now. Now, in the video, I introduced five foundational concepts that explained WHY the 5 Second Rule works. If that’s enough science for you, I understand. But if you still want to learn even more about the science behind the Rule, keep reading. And if you don’t have your headphones and want to wait to watch the video, then you’ll like reading this–it really explains everything. 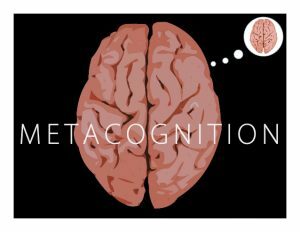 First, the 5 Second Rule is a form of metacognition, which means that it’s a way of tricking your brain in order to achieve your greater goals. The Rule allows you to beat your brain at its own game and distract it from the ways that it tries to sabotage you. Most of us live our lives in autopilot mode. In fact, research has shown that 40% of your day is spent in autopilot. When you’re on autopilot, you’re operating solely out of habit. And for almost all of us, our habits are not serving us. You see, your brain wants to protect you. It wants to keep you safe. It does this by keeping you from doing anything that feels scary, hard, or uncertain. So, our default habits are usually doing what feels safe and easy. Our default habits are doing the same old things over and over–in our default habits, in autopilot mode, we are not living our greatness. We are stuck. And we are not improving. And, most of all, we feel out of control over our lives. When you feel out of control, when you’re living without a feeling of real control over your life and outcomes, you lose functioning of something called the prefrontal cortex. 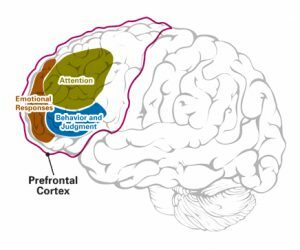 The prefrontal cortex is really important–it’s the part of the brain that’s involved things like decision making, planning, and working towards goals. I’m not making this up–it’s been studied by Amy Arnsten, a researcher at Yale, and by researchers at UC Boulder. What you need to do is take control of your prefrontal cortex. And you do this by creating a feeling of control in your life. This is where the 5 Second Rule comes into play. 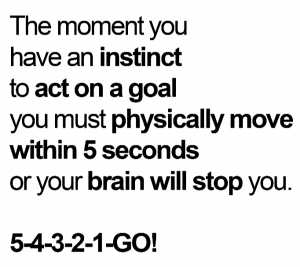 When you count down 5-4-3-2-1, you’re taking a deliberate action. The countdown pushes you out of autopilot. And when you act, you’re exercising control and you’re turning on your prefrontal cortex. By taking actions that make you feel in control of your life, your life will literally begin to change in every single way. As you use the Rule, you cultivate what researchers call an “internal locus of control,” which means that you believe you have control over your outcomes and future success. Research shows us that those with an internal locus of control are happier, in better health, more likely to achieve at work, and have lower levels of anxiety and depression. And the more often that you use the Rule, the easier it becomes to keep using it and keep feeling a sense of control over your life. Why? The principle of momentum. It’s the same in science and in psychology. 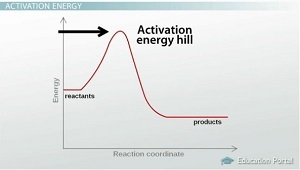 Science proves that the initial amount of energy to start a reaction, the “activation energy,” is significantly higher than the amount of energy required to keep it going. Same in life. That activation energy required to get you going is really hard to come by, but when you use the Rule, you can push past your feelings of resistance. And once you’re using the Rule, it becomes much easier to keep making forward progress, thanks to the momentum which is propelling you forward. The 5 Second Rule is so simple to use that it’s easy to keep moving in the direction of your goals and dreams and keep the momentum going. Along with momentum, something else keeps you moving forward: The Progress Principle. Research from the Harvard Business School has demonstrated that making progress, even in small ways, is the key to productivity and happiness. The 5 Second Rule allows you to make forward progress every single time that you use it, which in turn leads to a better mood and increased productivity–which makes you more likely to keep using the Rule! It’s a positive feedback loop. And that’s not the only positive feedback loop that the Rule creates. Usually, you’re locked into a negative feedback loop regarding your habits. 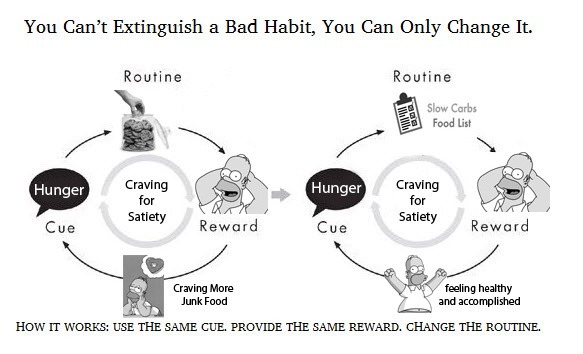 For example, you have a habit of eating unhealthy, which in turn makes you feel guilty, which actually makes you eat more. It’s a negative spiral. You see, you will always have that urge to engage in a negative habit. You’re going to have the urge to smoke or skip a workout or procrastinate. And that’s okay. Don’t expect the urge to go away. You’re not a failure for feeling the urge. Instead, when you feel triggered to engage in the negative behavior, you can use the Rule, 5-4-3-2-1, to replace the negative action with something positive–and begin to create new behavioral patterns. This is what researchers call “the Golden Rule of Habits.” It’s replacing the negative behavior after that urge with something more positive and using the 5 Second Rule to help you take that positive action. As your habits change and using the Rule becomes natural, you are now acting with something researchers call “a bias towards action.” Simply put, it means that you are inclined to take action. Soon, instead of hesitation and procrastination, your default mode becomes one of taking action. And…the more you exercise that bias towards action, the more you improve your internal locus of control, which I mentioned above! There’s another key principle at play here. It’s called behavioral flexibility, and it ties directly into the idea of bias towards action and locus of control. Recent research has shown that your brain never stops growing. In fact, you have the ability to learn new things throughout your entire lifetime. And as you use the Rule over and over, you develop a bias towards action, which soon becomes a habit, and as you create new habits you become an entirely different person. You actually can develop new neural pathways which lead to lasting behavior change. It’s incredible. Your default mode becomes action, not hesitation. And, the more action that you take, the better your life will become. This is a concept in psychology called “Do Good, Be Good.” It actually dates back to Aristotle. It’s the idea that you can’t just think yourself to change. You need to actually take action. 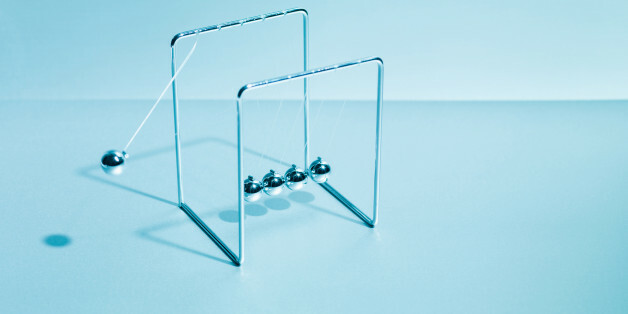 As you use the 5 Second Rule, which in turn helps you develop a bias towards action, new habits, and eventually new neural pathways, it’s easier to keep taking action–and your entire mindset will continue to change for the better. You’re no longer thinking. You are doing. And doing changes your life. As you use the Rule to make decisions that put you in control, no matter how small they may be, a huge shift happens. You learn you can count on yourself. 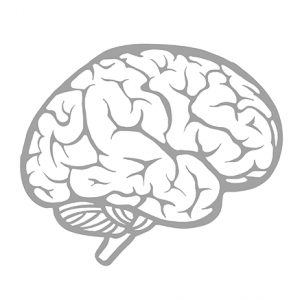 You keep your prefrontal cortex activated, which helps you keep making decisions that put you in control. And you develop what is called “authentic pride”–it’s the type of pride that is fueled by personal confidence and success. New research from the University of British Columbia says that “authentic pride” can be one of our biggest motivators to crush our goals. So, as you feel more pride in yourself, you become even more motivated to keep pushing in the direction of your goals and dreams. I hope that learning all of this information helped you to learn WHY the 5 Second Rule works. But honestly…you don’t even need to spend your time THINKING about why it works. You just need to start using it, 54321, and see the results in your own life. The 5 Second Rule is all about action. It’s time to act. So, every time you feel yourself shifting into autopilot, count 5-4-3-2-1 to bring awareness to your mind–and immediately act, shifting you into control, lowering your stress, and empowering you to keep making positive decisions. Now that you’ve got the science down, it’s time to learn more about HOW to use the 5 Second Rule to create huge change in every single area of your life. In particular, you are going to love Chapter 4 of the book. When you order The 5 Second Rule book, you will also receive 31 free video mentoring sessions with me. You can order it now here.